While Painting and Drinking. Classes are typically 2 hours and Dimitri leaves an extra 30 min. in between sessions to sett up for the next painting session.
? How does The Tipsy Red Fox work ? Pick a Painting from the image library, send Dimitri an email with details about how many are attending from 1-12, and the date and time you would like to reserve. Everyone paints the same painting Dimitri is teaching unless you just want to use the time and space as a studio session to create your own original piece. Come alone, with some friends, or schedule a private Painting party! The Tipsy Red Fox is perfect for a night out as an individual, a date night, and any small group of People. 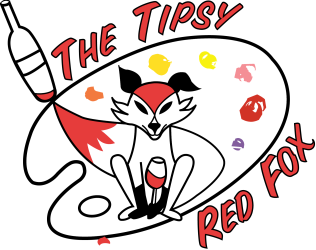 The Tipsy Red Fox works with all experience levels. So if you have never painted before Don't Worry Dimitri will walk you through step by step so you leave with a feeling of having learned by Experimenting with a little guidance.